[ Sir Denis Le Marchant, as Joint Secretary to the Treasury. ] Autograph Note Signed ('Denis Le Marchant') to J. Blackburn, requesting him to insert an 'Address & the reply of Her Majesty' in the Globe newspaper. 'Treasury | 9 August [ circa 1841 ]'. 1p., 12mo. In fair condition, on lightly-aged paper. Addressed to 'J. [sic] Blackburn Esq'. Reads: 'My dear Sir, | If this Address & the reply of Her Majesty has not already appeared in the Globe, perhaps you will insert it.' Le Marchant was Clerk of the House of Commons from 1850 to 1871. [Presentation copy of printed pamphlet.] The University of Wales. Its past, its present, and its future. An Address delivered befoer the Cardiff Cymmrodorion Society, On November 7th, 1905, in reply to Professor Henry Jones and others. 43pp., 12mo. Stapled. In grey printed wraps. 'With the Author's compliments' in manuscript at head of front cover. In good condition, with light age and wear, and stamp, shelfmark and red label of the Board of Education Reference Library. Autograph Manuscript score of 'Quartett (unaccompanied)', 'from "The Lord is King" ', with two signatures (both 'Stanley Marchant'). Score and first signature 10 January 1909; second signature 20 September 1936. On one side of a pink leaf, roughly 18 x 23.5 cm, removed from an album. Good, on lightly aged paper. Staves ruled out in red, with notes and text in black. 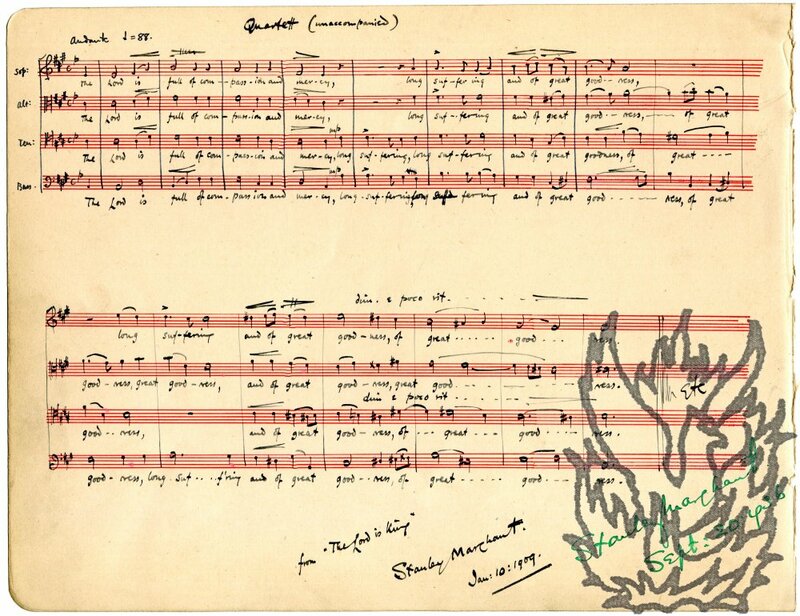 Seventeen bars, with staves for soprano, alto, tenor and bass.Titled 'Quartet (unaccompanied)' at head, with 'from "The Lord is King" | Stanley Marchant. | Jan: 10: 1909.' at foot. 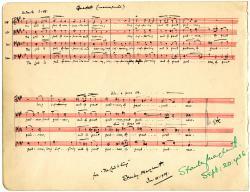 Beside this, in a larger, looser hand, in green ink, is a later signature: 'Stanley Marchant | Sept: 20: 1936'.